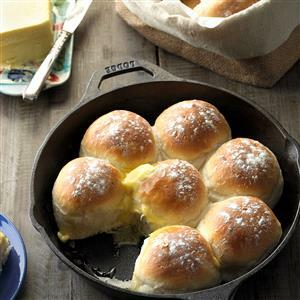 My family loves these rolls, which is why they're requested often. They don't take long to make because quick-rise yeast is used. In a large bowl, combine 2 cups flour, sugar, yeast and salt. In a small saucepan, heat water and butter to 120Â°-130Â°. Add to dry ingredients; beat until smooth. Stir in mashed potatoes and enough remaining flour to form a soft dough. Turn onto a floured surface; knead until smooth and elastic, about 6-8 minutes. Cover and let rest for 10 minutes. Divide into 16 pieces. Shape each into a ball. Place in two greased 8- or 9-in. round baking pans or ovenproof skillets. Cover and let rise in a warm place until doubled, about 30 minutes. Preheat oven to 400Â°. Sprinkle tops of rolls with additional flour. Bake 18-22 minutes or until golden brown. Remove from pans to wire racks. Yield: 16 rolls.